Air Supply - Lasttix. Be first in line for last minute tickets. 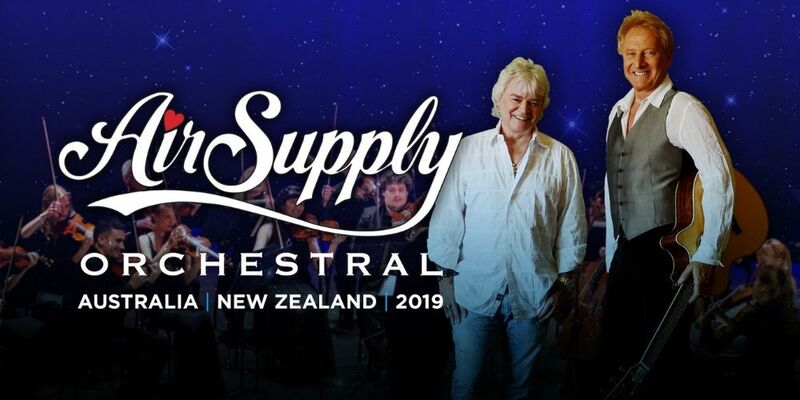 Air Supply – one of Australia’s most loved and successful musical exports – is set to return to eagerly awaiting fans in 2019 for a string of very special shows featuring an impressive twenty-piece orchestra. Classic hits such as 'Lost in Love', 'Love and Other Bruises' and 'All Out of Love' will be given a truly sumptuous presentation by the global superstars, who have been thrilling audiences for over 40 years. Arguably one of the most successful Soft Rock duos of all time, Air Supply’s albums Lost in Love, The One That You Love, Now & Forever, and The Greatest Hits have sold in excess of 40 million copies. In 2013 the duo were inducted into the ARIA Hall of Fame. Showcasing gorgeous orchestral renditions of Air Supply’s all-time hits (and some of the most beautiful love songs ever written), this will be an evening to remember for fans young and old.